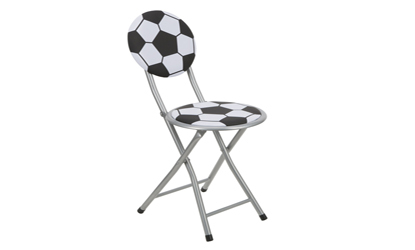 Football design folding chair, perfect for extra guests and space saving requirements. Small and sturdy with a football print design, the metal folding chair can be used outside, on balcony, patio or as a cool kids bedroom or desk chair. The metal folding chair makes an ideal folding kitchen chair, brought out for breakfast and then tucked away after. Ideal if you have a small kitchen or dining area. Padded for extra comfort, with sturdy modern design, the metal folding chair is light enough to easily move around and store.